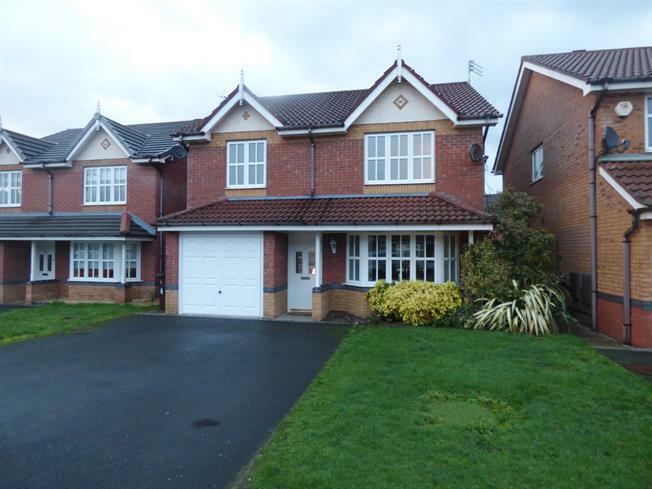 4 Bedroom Detached House For Sale in Liverpool for Asking Price £215,000. An amazingly well appointed detached family home which has been well maintained and upgraded throughout and must be viewed internally. The accommodation in brief comprises entrance hallway, downstairs WC, lounge, dining room, breakfast kitchen, conservatory, utility and storage room. To the first floor are four bedrooms with two en suites and the family bathroom. There are gardens to the front and rear and a double driveway and garage. Doors off to various rooms. Laminate flooring. Radiator. Staircase leading to the first floor. Double glazed sliding patio doors leading into the Conservatory. Radiator. Double glazed window to the rear overlooking the gardens. Range of wall and base units incorporating granite work surfaces with inset stainless sink and mixer tap over. Five ring gas hob with glass extractor hood over. Integrated double oven. Integrated dish washer. Central island with stools. Radiator. A triple aspect double glazed room with windows and double doors leading out to the garden. Laminate flooring. Ceiling fan. Double glazed window to the side. Suite comprising WC and wash hand basin. Tiled flooring. Range of wall and base units incorporating roll top work surfaces. Space for tumble drier. Wall mounted central heating boiler. Under stairs storage cupboard. Double glazed window to the side. Doors off to various rooms. Loft access. Double glazed window to the front. Suite comprising shower cubicle with mains shower, pedestal wash hand basin and WC. Airing cupboard. Tiled splash backs. Double glazed window to the side. Suite comprising shower cubicle with mains shower, WC and pedestal wash hand basin. Tiled splash backs. Tiled flooring. Radiator. Double glazed window to the rear. Laminate flooring. Radiator. Double glazed window to the side. Suite comprising bath, pedestal wash hand basin and WC. Tiled flooring. The property is approached by a double driveway which leads up to the front of the house. There is a lawned area to the front of the house and the main enclosed gardens lie to the rear of the property. There is a lovely patio area and lawn which is bordered by a an array of trees and shrubs.